Here’s an exciting new series by Sara Wolf with an excerpt to give you a taste! 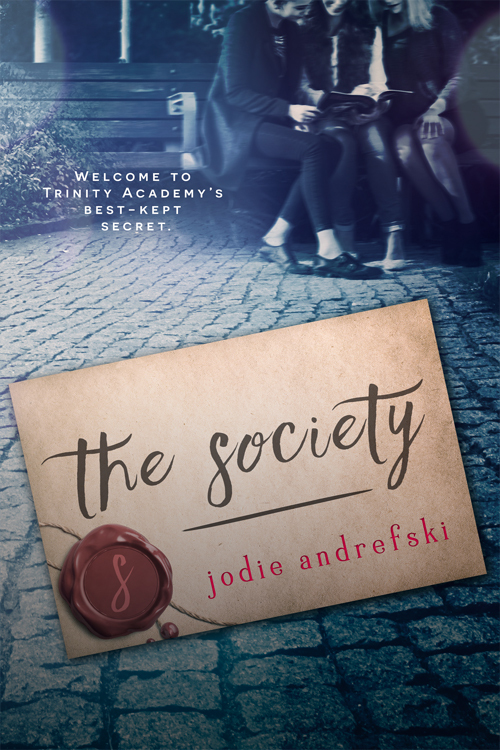 Thanks to NetGalley and Entangled Teen Publishing for the advanced reading copy of The Society by Jodie Andrefski! The Society is a wonderful, trying to find yourself, coming of age story. Jeremy is a great and loyal friend to Samantha (Sam). Sam needs the type of stability that Jeremy’s friendship gives her, since her family has been broken apart and she is relentlessly bullied because of acts her father has committed. Now she wants revenge. Sam lives with her Aunt Loretta, who struggles with her health and dementia. Sam and Aunt Loretta have a wonderful bond and love each other unconditionally; which they both need. While Sam is struggling with both parts excitement and guilt about her revenge, she meets a new boy, Ransom. At this time, Jeremy becomes upset at Sam for her revenge plot and doesn’t want her to become a bully also. Jeremy believes Sam is above that. I don’t want to give anything away, but I do recommend reading The Society to find out what happens with Sam, Jeremy, Ransom and the bullies. I enjoyed the angst and the dynamic relationships. This story also sheds light on unconditional love and support and also realizing our own importance and self worth. Thanks to NetGalley and St. Martin’s Griffin for the arc of The Hidden Twin by Adi Rule! The Hidden Twin contains a new take on mythological fantasy. Clever wit and creativity make this story interesting enough that I had a hard time putting it down. I enjoyed the bravery of the unnamed twin and the silliness of Jey, as well as the supporting characters. 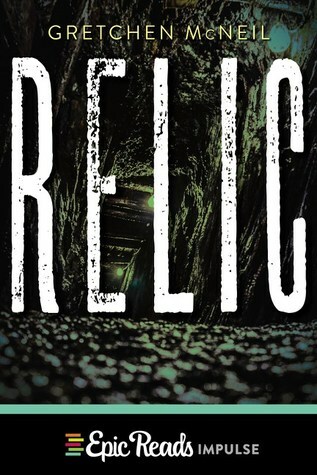 Relic by Gretchen McNeil is a supernatural mystery read. Annie and her friends are graduating and planning their summer of “no regrets” before leaving for college in the fall. They take a trip to the lake, where they venture into an old, deserted mine. Somehow Annie gets separated from the rest of the group. The plot thickens, becoming more mysterious and supernatural. People are being killed one at a time in horrific ways. I give Relic 3.5 stars because the writing is done well, without grammar errors, but the story line skips ahead too quickly in some parts. The Anamet conclusion is almost without proof or explanation. Why couldn’t Annie use her tablet to contact Sonya when she needed a ride; the same way she contacted Jack? The ending feels rushed. A quick read for readers who enjoy being a bit spooked, but are okay with a rushed story. Thanks to Algonquin for the free paperback of The Walls Around Us by Nova Ren Suma! The story is confusing at first and bounces back between two people and this made me unsure of the names for a bit. Little by little, the text became clearer. Amber’s story makes sense because she’s the only one narrating for several chapters in a row and on page 50, the story becomes supernatural when Amber sees a face she doesn’t recognize. Violet or Vee talks about Ori and hints of some of the bad things Ori has done. Of course, Vee’s perspective is one sided. On page 108, the momentum picks up and makes the story more interesting. The lines blur between alive and no longer living. I had a difficult time telling if the story was going from past to present or linear/parallel. I feel for the characters and I can relate to Ori and the kindness she shows others; while Vee is cold, calculating and unfeeling. The story strongly interprets the insecure and lost feeling that many prisoners must feel, especially if their crime was justified due to self-defense. A very interesting read that takes patience to stick with! Thanks to NetGalley and Harlequin Teen for the advanced reading copy of Soldier by Julie Kagawa! Extreme excitement raced through me when I received this arc because I absolutely love the first two books in this series, Talon and Rogue! The points of view are Garret/Sebastian, Ember, Riley and Dante. Garret discovers that St. George and Talon are working together, even though they are supposed to be mortal enemies. Dante is given a promotion to be in charge of the vessels that have been created as warriors. Dante is sickened by what he finds. Ember and Riley continue to try to help the hatchlings and the rogue dragons. A new character, Jade, has come from a destroyed monastery to help prevent further damage to innocents. The story line moves along at a consistent pace while the characters remain interesting and the ending: Oh My Gosh! The fourth book in the Talon series will be called Legion and I already am having a difficult time being patient while waiting to read it! I appreciate that the same theme has been used and kept on the book covers; they are simple but beautiful and elegant. Thanks to NetGalley and Berkley Publishing Group for the advanced reading copy of Arena by Holly Jennings! Arena contains nothing but fighting for the first chapter, then the fighting is explained. A team (Defiance) is participating in a virtual reality gaming tournament. Kali is the main character, and after the team captain (Nathan) dies from a drug overdose, Kali becomes captain. Virtual reality fighting uses gamers and athletically trains them to be on teams that compete for worldwide viewers and sponsors. Rooke replaces Nathan on the team at the same time Kali is promoted to team captain. Arena is about virtual gaming but also so much more: the interesting and dynamic characters; the problems gamers have to face with sponsors, athleticism and keeping what is virtual separate from what is true reality; addiction; the relationships between the characters and handling celebrityhood. I consider Arena by Holly Jennings in the New Adult genre due to some swearing, violence and intimate scenes. Wonderful writing makes the story flow! I will be watching for future books by Holly Jennings! Thanks to NetGalley and Houghton Mifflin Harcourt for the arc of Tell the Wind and Fire by Sarah Rees Brennan! Tell the Wind and Fire is a take on A Tale of Two Cities with a bit of magic involved. Lucie’s boyfriend, Ethan, has a doppelganger named Carwyn. Ethan lives in the Light city and Carwyn is from the Dark city. Lucie’s parents are both non-existent in her life. Her mother disappeared (she was punished for using magic to heal people) and her father was tortured and drained of his blood and dark magic use. Lucie’s father has some lucid moments but not many. She gets involved in the rebellion unknowing who is leading it. The dynamic characters make this a wonderful book! I also appreciate the author’s note at the end of the book that explains her reasoning for basing her story on A Tale of Two Cities. Highly recommended for fantasy readers as well as readers of Charles Dickens. 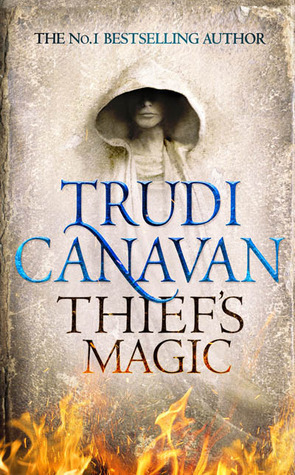 Thanks to NetGalley and Orbit Books for the ebook of Thief’s Magic by Trudi Canavan! This story is told in alternating points of view – Tyen’s and Rielle’s. Tyen is at an archeological site when he discovers a living book – a person (Vella) transformed into a book by a powerful sorcerer. He took her knowledge and flesh and literally made her into a book and used her skin for the cover and pages, hair for the binding and tendons for the glue. At this point I was very interested in the book! When it abruptly stopped and changed to Rielle’s story, I was a little thrown. I wasn’t sure why the transition took place. Rielle’s story is completely different from Tyen’s. Rielle is middle class but she and her family believe that it will be difficult for her to find a husband. She falls in love with an artist but is afraid to use magic to prevent pregnancy. Magic is forbidden in her world. I rate Thief’s Magic three stars because it’s difficult to see a correlation between Tyen’s and Rielle’s stories and because of the abrupt change from one story to the next. Maybe reading the rest of the series would help tie the two worlds together better?